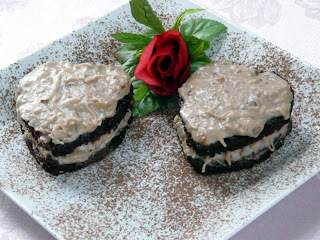 Polish Classic Cooking: Chocolate heaven! Witamy! Laura and I recently went to a cooking demonstration at the Spice and Tea Exchange in Old Town Alexandria VA, an event held once a month with local chefs. This particular evening was with Chef Dennis Marron from The Grille at Morrison House and Jackson 20. There were four tastings and each was to die for! The chef selected the menu and recipes around the amazing spices and flavored products available in the shop. The evening started with a cocktail called “Bourbon and Spice” - a mix of fine, old bourbon with brown cardamom pod, sumac, maple and espresso syrup; just before serving, the rim of each glass was dipped in a mix of maple granules & espresso sugar! The 2nd course was a White Peony Tea Smoked Diver Scallop, seared on a rose salt block, paired with a Bamboo Green Rice Cake. The process of smoking the scallops was amazing. Chef Marron had the scallops in a rectangular cake pan covered with plastic, into which he fed a little rubber hose which was connected to a little jar-like container of the smoldering White Peony Tea Leaves (and yes, there were a few bad jokes about not inhaling and what was really being smoked). The cheese course was next, featuring a sweet onion imported blue cheese with onion bread, dried shallots, apple cider reduction, blue cheese powder and apple chutney. The combination of sweet ‘n savory flavors and of the different textures stacked on top of each other was heaven on the palate. And then the sweet ending - a small tower of chocolate cake with coconut frosting, a marble-sized chocolate, salty truffle resting on a smear of New Mexico Chili Powder Chocolate Sauce. Well, the juxtaposition of salty yet sweet truffle with a dab of that spicy sauce was an explosion on our tongues. But as amazing as each course was, for me the cake was the biggest star of the evening. Without a doubt it was one of the most moist and flavorful American-style cakes I have ever tasted. I liked it so much and kept carrying on about it that Laura made it for us for Valentines Day – in the shape of a heart. She emailed this picture over to The Grille at Morrison House and they liked it so much they’re going to put the recipe on their website. But because we appreciate each and every one of you so much we’re sharing it right here, today. Smacznego! Chef Dennis Marron’s Chocolate Cake, February 2011, Spice and Tea Exchange, Alexandria, VA. Mix the dry ingredients well in a large mixing bowl. Slowly add wet ingredients and incorporate. Pour into a greased sheet pan. Note: Laura used a 10½” x 15½” pan which worked well…she could have used a somewhat smaller pan to yield taller layers, but anything bigger than 10½ x 15½ would not work very well because the batter will be too thin. Bake at 325 until fork comes clean – about 30 minutes depending on the size of the pan. Watch the edges which will tend to harden earlier. Allow to cool. Cut into desired shape using cookie molds, upside-down glass, etc. While the cake is cooling, add all frosting ingredients into a heavy-bottom, non-corrosive pan, i.e. stainless steel. Cook on medium heat, stirring constantly until it reaches 180 degrees. Remove from heat and whisk until cool. Spread frosting on the first layer. Set the second cake layer on top and spread with more frosting. 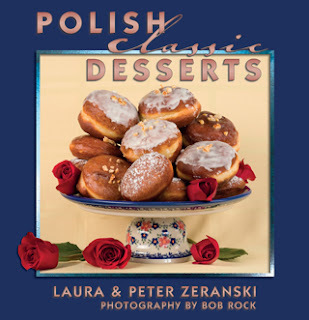 A husband-and-wife team that has been cooking and eating classic Polish food together for almost forty years. © Copyright 2011 LoraPeet Ventures LLC. All rights reserved. This material may not be published, rewritten, or redistributed without written permission.